Did you know that electrical problems were the cause of 6.3% of all residential fires? Your home is especially at risk if you live in an older house with old electrical wiring. If you're hesitant to update electrical wiring in your home, here are 5 reasons why you may reconsider that decision. Did you know that electrical problems are the cause of 6.5% of all residential fires? For houses with outdated wiring, the risk is especially high. If you own an older home, aging and dangerous electrical systems could be lurking behind your walls and putting your family at risk. You may be hesitant to update electrical wiring in your home, unsure if it is worth the cost or hassle. If so, here are five reasons why you should consider replacing and repairing your wiring. If you live in an older home, your outlets may only have two prongs instead of three. Most modern appliances have the third prong, which can pose a problem for homeowners. Two-prong outlets, which can't provide enough power, can cause fuses to blow. Many devices or appliances plugged in simultaneously can increase the risk of blowing. This is true for energy-intensive fixtures like refrigerators because fuses can easily overload. Old-fashioned outlets are especially prone to power surges. The third prong of modern plugs serves as a connection to the ground wire in your home electrical system. This grounding conductor protects homes from surges of power. Wiring in older homes often doesn't meet today's safety standards. This old wiring, known as "knob-and-tube" wiring, was standard until the 1930s. These outdated systems are prone to failure and can even electrify the wood in your home. It may be difficult for the average homeowner to tell if their house is full of old wiring. Warm outlets, loose plugs and switches, and flickering of power can be symptoms of outdated wiring that is in need of replacement. Victorian homes have minimal outlets, designed for a few electric lights to replace the oil lamps and candles of old. An old home that has never had an electrical renovation uses way more power today than it was designed for. They are incapable of accommodating the needs of today. Homes from this period service 100-150 amps of electricity. A modern family's energy consumption typically needs 200 amps of electrical service to meet their needs. Upgrading your electrical capacity to 200 amps will allow you to run a high number of appliances without the risk of overloading. You'll be more prepared for future product innovations and capable of powering them. Electric ovens, air conditioners, heat styling devices, and other high-energy fixtures all used together can easily consume more than 100 amps at a time. When electricity was first installed in residential homes, there was no way they could predict the energy needs of a modern family today. You could potentially max out the electric capacity of your home on a regular basis without even realizing it. Electrical malfunctions in homes account for 51,000 fires each year. These fires result in an estimated 500 deaths and 1,400 injuries. Property damages from home electrical fires cost a staggering 1.3 billion dollars. Faulty outlets with only two prongs can be overloaded, causing sparks to erupt from blown fuses. Loose wiring in switches is also often the source of electrical sparks. Knob-and-tube wiring can come loose and electrify the wood, making surges that can cause wooden structures of the home to catch fire as well. Houses built before the advent of modern appliances are especially prone to fire risk. They are not wired for high-powered electronics such as televisions or computers. The demands of multiple items plugged in at once can easily overwhelm their wiring, causing blown fuses and potential sparks. Even homes built as recently as 25 years ago may need upgrades to reduce the risk of electrical fire. Be wary if you use extension cords or power strips to expand available outlets. You may be taxing your electrical system beyond its original design. If you supplement your heating system with space heaters in winter, these heaters can increase your fire risk. Not only can they ignite nearby materials on their heating coils, but their heating elements also need a lot of electricity to heat them. Power surges are one of the most potentially damaging risks to the electrical components in your home. Whether it be from lightning, downed power lines, or power station fluctuations, power surges can cause serious damage to devices in your home. Computers can suffer memory loss, fried components, and even complete failure. Devices such as TVs and gaming systems are also extremely vulnerable to power spikes. Modern electrical systems can include whole-house suppressors. These can protect your home from surges of 40,000 amps or more. Used with surge protectors, these upgrades can keep your electronics and appliances safe from power spikes. Antique wiring was designed for utility, not convenience. If you own an old house, you might find yourself regularly frustrated with your lack of outlets. An upgrade to your electrical wiring can include having additional outlets installed in your home. Modern, three prong outlets can be added to any room that needs more electrical access, such as your living room or even your garage. Spreading out your electric use between multiple plugs can also prevent the taxing of any one power source. You may see a decrease in your homeowner's insurance when you upgrade your electrical system. Many providers require that all electrical systems meet building codes. If your home still has knob-and-tube wiring, you might find it hard to get an insurance policy at all. Today's home buyers are also looking for convenience in their potential purchases. Adding more outlets can add attractive benefits to your home if you're looking to sell in the future. You may add significant value to your home by making sure it is up to code for future inspections. Hiring a professional to update electrical wiring will prepare your house for the future. Preventing damage to your appliances and safeguarding your home against danger can give you peace of mind. If you're looking to increase the value of your home and protect it against electrical failure, installing new wiring is a great option. 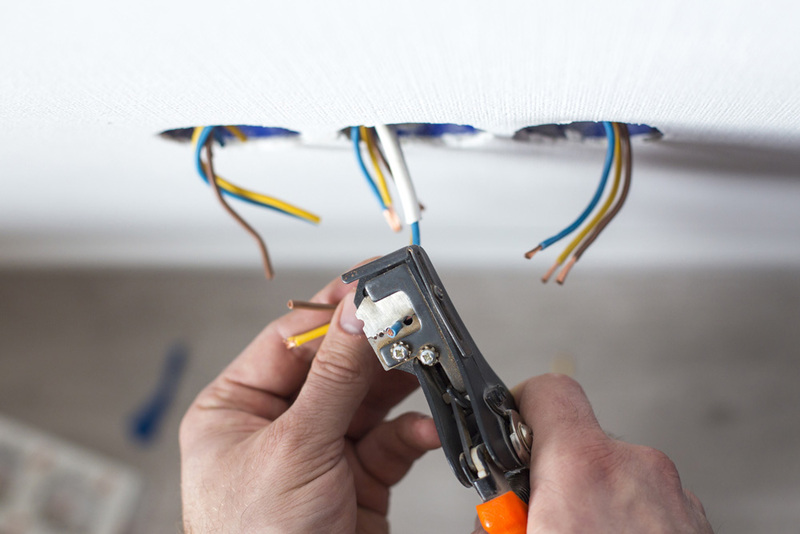 If you need professionals to replace your old wiring, be sure to reach out to us at any time.